In 2013, the U.S. Geological Survey, in cooperation with the U.S. Department of Energy, drilled and constructed boreholes USGS 140 and USGS 141 for stratigraphic framework analyses and long-term groundwater monitoring of the eastern Snake River Plain aquifer at the Idaho National Laboratory in southeast Idaho. Borehole USGS 140 initially was cored to collect continuous geologic data, and then re-drilled to complete construction as a monitor well. Borehole USGS 141 was drilled and constructed as a monitor well without coring. Boreholes USGS 140 and USGS 141 are separated by about 375 feet (ft) and have similar geologic layers and hydrologic characteristics based on geophysical and aquifer test data collected. The final construction for boreholes USGS 140 and USGS 141 required 6-inch (in.) diameter carbon-steel well casing and 5-in. diameter stainless-steel well screen; the screened monitoring interval was completed about 50 ft into the eastern Snake River Plain aquifer, between 496 and 546 ft below land surface (BLS) at both sites. Following construction and data collection, dedicated pumps and water-level access lines were placed to allow for aquifer testing, for collecting periodic water samples, and for measuring water levels. Borehole USGS 140 was cored continuously, starting from land surface to a depth of 543 ft BLS. Excluding surface sediment, recovery of basalt and sediment core at borehole USGS 140 was about 98 and 65 percent, respectively. Based on visual inspection of core and geophysical data, about 32 basalt flows and 4 sediment layers were collected from borehole USGS 140 between 34 and 543 ft BLS. Basalt texture for borehole USGS 140 generally was described as aphanitic, phaneritic, and porphyritic; rubble zones and flow mold structure also were described in recovered core material. Sediment layers, starting near 163 ft BLS, generally were composed of fine-grained sand and silt with a lesser amount of clay; however, between 223 and 228 ft BLS, silt with gravel was described. Basalt flows generally ranged in thickness from 3 to 76 ft (average of 14 ft) and varied from highly fractured to dense with high to low vesiculation. Geophysical and borehole video logs were collected during certain stages of the drilling and construction process at boreholes USGS 140 and USGS 141. Geophysical logs were examined synergistically with the core material for borehole USGS 140; additionally, geophysical data were examined to confirm geologic and hydrologic similarities between boreholes USGS 140 and USGS 141 because core was not collected for borehole USGS 141. Geophysical data suggest the occurrence of fractured and (or) vesiculated basalt, dense basalt, and sediment layering in both the saturated and unsaturated zones in borehole USGS 141. Omni-directional density measurements were used to assess the completeness of the grout annular seal behind 6-in. diameter well casing. Furthermore, gyroscopic deviation measurements were used to measure horizontal and vertical displacement at all depths in boreholes USGS 140 and USGS 141. Single-well aquifer tests were done following construction at wells USGS 140 and USGS 141 and data examined after the tests were used to provide estimates of specific-capacity, transmissivity, and hydraulic conductivity. The specific capacity, transmissivity, and hydraulic conductivity for well USGS 140 were estimated at 2,370 gallons per minute per foot [(gal/min)/ft)], 4.06 × 105 feet squared per day (ft2/d), and 740 feet per day (ft/d), respectively. The specific capacity, transmissivity, and hydraulic conductivity for well USGS 141 were estimated at 470 (gal/min)/ft, 5.95 × 104 ft2/d, and 110 ft/d, respectively. Measured flow rates remained relatively constant in well USGS 140 with averages of 23.9 and 23.7 gal/min during the first and second aquifer tests, respectively, and in well USGS 141 with an average of 23.4 gal/min. Water samples were analyzed for cations, anions, metals, nutrients, volatile organic compounds, stable isotopes, and radionuclides. Water samples from both wells indicated that concentrations of tritium, sulfate, and chromium were affected by wastewater disposal practices at the Advanced Test Reactor Complex. Most constituents in water from wells USGS 140 and USGS 141 had concentrations similar to concentrations in well USGS 136, which is upgradient from wells USGS 140 and USGS 141. 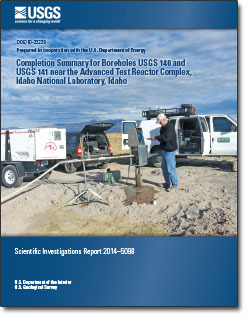 Twining, B.V., Bartholomay, R.C., and Hodges, M.K.V., 2014, Completion summary for boreholes USGS 140 and USGS 141 near the Advanced Test Reactor Complex, Idaho National Laboratory, Idaho: U.S. Geological Survey Scientific Investigations Report 2014-5098 (DOE/ID-22229), 40 p., plus appendixes, http://dx.doi.org/10.3133/sir20145098.